The space on a search results page for paid ads is valuable real estate and your ad will be one of nine other ads, like any valuable real estate you don’t want to waste it. So creating compelling and successful ads is crucial to success across the board for your account. Given that everything else in the account is solid, poor ads at the front end can damage success, ultimately delivering poor results. If the relevance between the search term and keyword is good, a poor ad can still restrict the volume of Clicks you can get, this can reduce CTR (Click Through Rate) and ultimately impact the QS (Quality Score). Conversely, great ads can garner more clicks, improve CTR, QS, and consequently reduce CPC’s & increase Ad Rank. There are 11 components to a text ad; we describe each one in detail here. Each component has to be set or has a default position, which can be changed when creating an ad. The headline is the most prominent component of a text ad, as the image below shows this is displayed in a larger font and is bright blue. As such a compelling headline is essential to grab the attention of searchers. The headline should typically contain the primary keyword in the same ad group as the ad. Use of the keyword helps to increase the relevance between the ad and the keyword, which impacts QS. The maximum length of a headline is 25 characters, which includes spaces and special characters. The Display URL, shown in green text in the image below, is the URL that is shown to the searcher; this can (and typically should) differ from the destination URL (described below). The display URL has to contain the domain of the website to which the ad is delivering traffic and the domain used in the Final URL (described below). 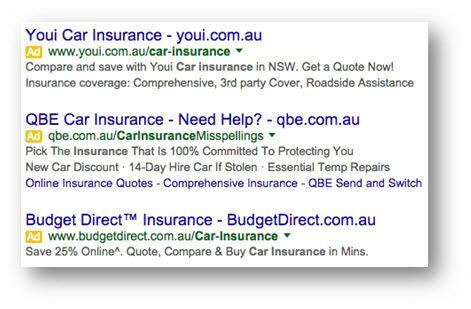 The display URL is a very common location to include keywords to improve relevance between the ad and the keyword. Split testing or MVT will enable you to test which combination of display URL works best. The description is where you can include information pertaining to the product or service that you are offering. Including promotional offers, discounts, prices, USPs (Unique Selling Points), etc within the description will help to inform searchers of what to expect if they click the link. The description should contain highlights or anything that differentiates you from your competitors. It’s important to create something unique and that stands out from the rest of the search results page. The description is broken into two lines, each providing space for 35 characters combining to give a total of 70 characters. Neither line can exceed 35 characters, but it is perfectly fine to continue a sentence from line 1 to line 2. AdWords limit you to 50 text and non-image or gallery ads per ad group and 4 million active or paused ads in an account. The domain used in the Final URL needs to match the domain used in the Display URL but there is not character limit to this component. It is also possible to add in a Final Mobile URL, which differs to the Final URL, which will be used if the ad is shown to users on mobile devices. This means that you can have one ad for both desktop and mobile users but with different landing pages. This operates in the same way as the Final URL, in that the domain name must match that used in the Display URL. This can a valuable component if you have good reason to provide mobile users with a custom landing page that addresses mobile user intent better than a catchall landing page. This has been phased out and replaced by the Final URL and Final Mobile URL (both described above). AdWords already provides functionality to filter ads by network, device, and criteria such as minimum Clicks or Conversions, so labels are only relevant when adding another criteria with which to filter or segment data. Either an ad targets all devices or just mobile devices; this is defined with this setting. The default is “All Devices” but in scenarios where you need a different type to CTA (Call to Action) for mobile users, having a mobile ad to serve can improve performance on mobile devices. Typically advertisers are aiming to have their ads appear in the top four positions, as these are the most prevalent, located at the top of the page above the organic search results. Some advertisers may optimise for ad position if other metrics are not available such as conversions or conversion values. But in cases where it is not cost effective for an advertiser, they may be forced to accept a lower position (5-10). The higher the position of the ad the higher the CPC (Cost Per Click) but this typically comes with higher CTR. You can see the average position of an ad as a metric; this can be a valuable statistic, which we cover in more depth in a guide on AdWords metrics. Nonsense: Incomprehensible or nonsense promotion: Garbage ad text, particularly generic or vague promotions, allowing ValueTrack tags visible in ad text, blurry or fuzzy image or video ads, blank, empty or gibberish landing page content. Promotions that are not relevant to the landing page. Use of claims such as “best taxi service in the world” that are not supported by third parties or the landing page. Sites that use pop-up or ads that block content from being viewed as well as anything else that can negatively impact the user experience. Misspelled words are a ‘no no’ but grammar is less clear as often in text ad copy you cannot write perfect sentences due to the character limit. That said, the ad copy needs to make sense to the user. 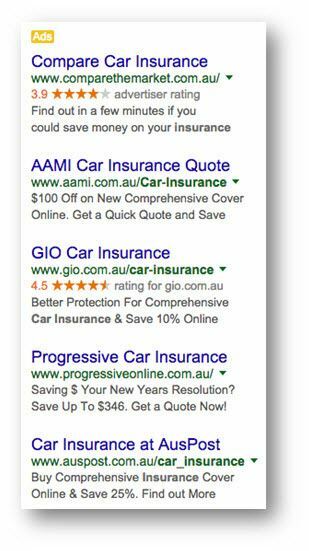 A disapproved ad can be quite common, for any number of reasons; often the reason will be highlighted in AdWords such that you can make the appropriate change to the ad. If the problem or violation of policy is serious enough this could result in domain disabling, which will only remain in place until the problem is resolved. If the violation is very serious or multiple policies have been broken, this can result in total account suspension. This can mean that you are banned as an advertiser from using Google AdWords, this can be extended to all related accounts. Special characters can help to make an ad stand out or have more impact, which can drive CTR. Characters such as those listed below are all valuable and can be used in ad copy, but overuse can result in an ad being disapproved. For example using three exclamation marks will result in ad disapproval. Description: Exclamation marks are very commonplace in ads and help in adding exclamation to a message or CTA. Description: Question marks engage a user, if they have a question, which you are answering then consider adding the question into the ad copy. Example: Paying Too Much For Your Mortgage? Description: Using rates and discounts in ads is very compelling and can encourage clicks. Description: Ampersands are a good way to reduce character counts, instead of writing “and” you can just use “&”. Description: Hyphens are a good way of separating or spacing words and characters where pipes (vertical lines) are not allowed. Description: These have more impact than when writing “dollars” of “AUD” for example. Description: Numbers can be used in prices, rates or when describing amounts of something, this is more efficient that spelling the numbers. Description: Not to be abused a tick can help make an ad stand out and shows that you do something. Description: This and the following two symbols are great ways to represent your brand with legal symbols that create an impression of trust and authority. Description: Again this symbol can create an impression of trust and authority. Description: Spaces allow you to increase the presence of a CTA by spacing the words out a little more. Symbols, numbers and letters that don't adhere to their true meaning or purpose such as using "@ home" to mean "at home"
If the search term pushes the total character limit over 25 characters, the text shown in the code (Blue Dresses) will be used instead. DKI can be used in the headline, description, display URL, and Destination URL. Use the Ad Preview Tool to test the ads using this feature to ensure they are delivering the desired results. Dynamic Keyword Insertion can be a useful tool but it does have down sides. Having competitor brand names appear in your headline is a risk if they are not blocked by negative keywords. Other potential implications are having ad copy that doesn’t make sense; search terms more often than not don’t use proper grammar. Even grammatically correct searches may not fit into the ad copy and read properly. DKI can improve CTR and hence have a positive knock on effect to the whole account. When used properly and appropriately DKI can improve overall account performance by making the ad more relevant to the search term and ultimately the searcher. Mobile traffic has been rising for many years and this isn’t going to change in the near future, combined with the growing prevalence of smart phones throughout society, more and more people will be accessing the net through mobile devices. User intent can vary wildly between devices for different products and services. Some purchases are typically not made on mobile devices where as others can be much more likely to be relevant to mobile users. Consequently creating mobile specific ads to show to mobile users can be incredibly valuable, including click to call extensions and different CTA’s that appeal more to mobile users. For example a company providing downloads of a white paper may be better offering something different to mobile users who are unlikely to download a white paper to their phone. For some businesses there is no need or significant benefit to having custom mobile ads, but more often than not, it is a good idea to take advantage of this feature. Ad Extensions are a powerful feature allowing you to show additional information to users. This can be phone numbers, locations, links to other parts of the website among many others. Ad extensions provide users with more reasons to click on your ad and also occupy more of the valuable SERP real estate. This is really a topic unto itself, and we cover it in a more in-depth guide to AdWords ad extensions. Split testing is a pivotal component in the process of optimising your ads, campaigns and improving account performance. Split testing is the process of creating two ads and running them against each other to see which one performs the best; then deleting the lower performer and creating a variant of the higher performing ad; this then runs through a process of rinse and repeat. Depending on what performance metric is being used to determine the highest performing ad, over time this metric should steadily improve. MVT (Multi-variant Testing) is essentially the same as split testing but it involves using more than two ads at any one time. We discuss both split testing and MVT in a more comprehensive guide. You should only include the above if they are genuine, advertising prices and discounts that do not exist on your site and specifically on the landing pages is not good. These help to drive up CTR and conversions, if people think they are getting a good deal. This is not an exhaustive list but provides some examples of good CTA’s, primarily these should be relevant, do not say ‘get a quote’ if the user cannot get a quote. Use the target keyword within the ad copy at least once, typically embedding this in the headline is where it has the most impact. This shows that your ad (and likely the landing page) are relevant to the user’s search term. Moreover this builds relevance between the keywords and ad, which are factors in QS. All of your competitors are advertising the same services or products to prospective customers, so you need to stand out or to provide a reason for someone to click your ad rather than another. USP’s or features, services, or components of those that are unique achieve this goal for you. Ensure relevance and consistency between the keywords, the ad and the landing page to improve QS as much as possible. Ensure that any offer used in the ad copy is used on the landing page. In fact using all of the ad copy on the landing page in locations like the Meta description (if using dedicated landing pages) can help improve this relevance. Where useful to do so, create mobile ads with mobile-targeted CTAs. Well-designed mobile ads encourage CTR and improve performance. There is no such thing as a perfect ad or an ad that can’t be improved; the way to improve ad performance is to test them against each other or against a hypothesis. The best way to do this is to split test or do multi-variant testing. There are only a few fields that can be edited but the volume of potential variants is essentially infinite. For example, try including prices or rates, see which works best and then try moving the rate to different fields / parts of the ad. Continue this process over and over again; trying completely new ad copy verses variants of high performing ad copy.